MR. WHITMAN: Today we have with us again General Carl Strock, somebody that doesn't need any introduction to you. He's been kind enough to come here on a periodic occasion and give you an update on what the Corps of Engineers has been doing down in Louisiana. And without anything further, I think I'll just turn it over to him. And he's got some things that he wants to open with, and then we'll get into some questions. GEN. STROCK: Thank you, and good afternoon. I really do appreciate this opportunity to spend a little time with you all, and what I'd like to do is just remind you of some of the elements of the Corps of Engineers role in response and recovery to Hurricanes Katrina and Rita, and then answer any questions you might have of us. Before I start, I'd like to clarify one thing that's a bit confusing to some folks. When you see me up here in uniform and I talk about the U.S. Army Corps of Engineers, there are really two Corps of Engineers. One is the branch of the Army, and that branch as about 80,000 soldiers which are active Guard and Reserve, and then you have a major command of the Army called the U.S. Army Corps of Engineers, which is what I command. And that is comprised of 34,000 people. All but about 500 are civilians, career civilians, in all fields of endeavor. So when we talk about the Corps of Engineers response here, it's mainly those people that I'm talking about. So in the past you've seen me as a military officer and I refer to, well, that's what the military's doing, that was some of the confusion in previous occasions when I've spoken with you. So that's who I am and what we do. We have standing missions in civil works. We're responsible principally for the nation's water resources. We do inland and deep draft navigation. We do flood control, hydroelectric generation, a lot of recreation, and a lot of things in the civil community. And those skills then come to bear when we respond to disaster. We also have a large military construction mission, which is worldwide, where we support military forces and provide the facilities they need for training and readiness. 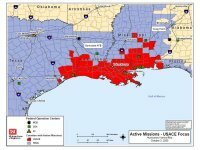 In terms of our response to hurricanes Katrina and Rita, again we're doing three ways: direct support to FEMA; we're in support of the Department of Defense response, which is also in support of FEMA; and we're doing our inherent mission responsibilities mainly related to flood control and navigation. Where FEMA is concerned we are responding as part of the National Response Plan, which is based on the old Federal Response Plan, which used to be just directed at response to natural disaster. With the creation of the Department of Homeland Security and putting FEMA under the department, they've broadened the response plan to include response to terrorist attacks with the idea that the cause of the catastrophe, while important, is not really relevant in terms of our response. Because what you have is the same results: you have displaced people in need of food and water and shelter and medical attention and all those things. And so FEMA now responds to -- regardless of the nature of the incident -- responds in pretty much the same way, and that's the theory behind the National Response Plan. We are responsible for what is called Emergency Support Function 3, which is ESF3; that's public works. There are 15 of these ESFs and -- for which different branches -- or different departments have responsibility. Under that, we have missions to provide the bulk ice and water. We provide temporary power, temporary roofing, debris removal, which is our biggest mission in this one. We're doing technical assistance, and we're responsible for inter-agency coordination of infrastructure requirements in the response and recovery. We also do special missions like the un-watering of New Orleans that I'm sure you're very familiar with. In terms of support to the Department of Defense, it's mainly through staff augmentation. 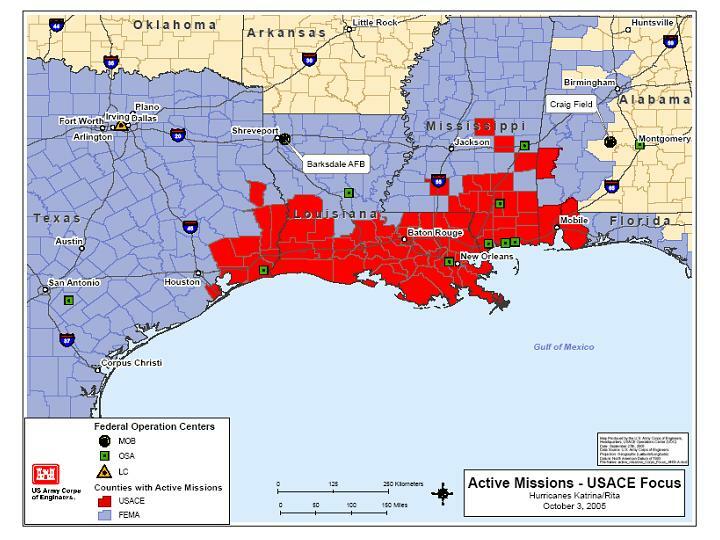 Both the Joint Task Force has stood up in response to Hurricane Katrina under General Honore, and the similar one that stood up under General Clark from Fifth Army to respond to Rita. Both of those had personnel from the Corps of Engineers; general officers who are in command of our divisions that went forward to become the engineer and took with them military and civilian staff members to help coordinate the activities of military forces -- federal military forces that were responding. Air Force, Navy, Marines and sea -- and Army Engineers were out there responding to the disaster. In terms of our own inherent missions, there's a public law called 8499, which gives us authority to do flood fighting without doing it under FEMA control, without being directed to do so, because we have a responsibility in those instances. So we are now using those authorities to respond to this, and that mainly takes the form of doing the actual flood fights during the emergency and then repairing the systems back to their original configuration following the emergency. We use these funds to do that. The other big mission is restoration of navigation. And we've now had two very successful occasions to get involved in that, first under Katrina and then under Rita. And in both cases we've worked very closely with the National Oceanographic and Atmospheric Administration to do surveys of the ports and channels, and with the Coast Guard to restore navigation aids. And then, where necessary to move obstructions or shoaling, the Corps of Engineers goes in and takes care of that mission. So we've done that in both cases. Just a quick update. As you know, Rita did not have the catastrophic impact that we thought. But like Katrina, we were prepositioned. We had response teams ready to go and then move into the disaster area, once the weather cleared, in all the areas that I talked about. One of the more challenging aspects of Rita for us has been the response to -- the need to respond to power requirements. There was some significant damage to the fixed power production in Texas and so there's been a very heavy reliance on temporary generation. We're talking fairly significant generators here. We're not talking little Honda things; we're talking generators that can power up whole hospitals or administrative facilities. So generation has been a big role here. We also had a significant roofing mission in Katrina -- I mean in Rita, much like in Katrina. Right now we're looking at -- we estimate about 70,000 roofs in Louisiana and about 35,000 in Mississippi, and about 5,000 in Texas. So a big mission to go in and allow people to reoccupy their homes until they can put permanent repairs in place. This is critical to solving some of the housing shortages we see, is to put people back where they live. The debris mission is also one of the most significant ones for us. Right now we estimate that we have somewhere between 40 (million) and 70 million cubic yards of debris to move. And again, to put that in perspective, if you can all remember Hurricane Andrew, about 18 million yards of debris then, and it took about nine months to clean up. So this is a huge effort on this. The range there has to do with whether or not we do removal of private debris. Typically we just remove debris from public rights of way, and we will take private citizens' debris when they bring it to those rights of way. That's about 40,000 (sic/40 million) cubic yards of debris. If we get involved in demolition and removal of residential and structural debris, then it could go up to 70 million cubic yards. We have been very successful so far. We've moved about 8 million cubic yards in the last 30 days. Again, think back to Andrew, 18 million, nine months. We've moved 8 million in 30 days here. And the reason we were able to do that is we put very large contracts in place and we surged on this mission because it really is the way that we set the conditions for recovery by getting people access back into their homes and towns and allowing the recovery to begin to take place. So debris has been a big part of this mission. Associated with that -- well, before I get into that piece, the other things we're doing right now that are related to our inherent responsibilities are conducting project condition surveys. And we do this for a couple of reasons. First of all, we need to put the projects back in their condition that they were pre-landfall, and so we got to go out and figure out what needs to be done there and then make those needs known to Congress and the administration for resourcing. But the second is, we also need to make sure the decision-makers are aware of the level of risk associated with the condition of the projects, especially our flood and hurricane protection projects. And as you know, Mayor Nagin, in his decision on when and how to reoccupy the city of New Orleans, has to understand those risks. And we characterize the risk to the citizens of New Orleans in two ways. First of all, risk to normal rain events because the city's pumps which normally pump down the rainwater are at significantly reduced capacity. So, for example, in central New Orleans, the pumps are only operating at about 40 percent capacity, so it's conceivable if you get a prolonged rain event you could get another six feet of water back in there that the pumps simply can't contend with. The other risk has to do with the integrity of the levee systems around New Orleans. We saw that in Hurricane Rita we had some overtopping of the repairs that we made following Katrina. We anticipated a storm surge of anywhere from three to six feet in Lake Ponchartrain, and in the Inner Harbor part of the city we got about eight feet of storm surge. So we were not prepared for that, so we saw elements of St. Bernard's Parish, specifically the Ninth Ward, got re-flooded during Rita. Just to give you an idea of the kind of forces we're dealing with here, Rita was over 200 miles away, but it caused a surge of that magnitude in the Inner Harbor of New Orleans, eight feet of additional water from a system that passed that far away. So these are tremendously powerful events we're dealing with here. The other thing, of course, we're doing is assessing the performance of the system because we want to put it back in shape as quickly as possible. It is our goal that by the beginning of next hurricane season, which is around the 1st of June of next year, we will have the Category 3 protection that existed prior to Katrina back in place. And that's an ambitious goal, but we think we can make it. One of the critical things there is if there's some problem with the design we had there, if there was some reason why we had breaches in the flood walls in the inner part of the city that had to do with a design error or anything like that, we want to find that out so as we rebuild the system we can incorporate those fixes into it. So just real sense of urgency at understanding exactly what happened out there is a big part of our effort right now. Let me close by just talking a little bit about contracting, because I know there's a lot of interest about that. We have used, in some cases, sole-source contracts, but I would say that that is -- only as a last resort and only with full justification do we do that. The federal acquisition regulations allow you to use sole- sourcing in emergency situations. We certainly faced that in the early days. And we did a number of both small business and large business sole-source contracts to get things going. Since that time, though, all of our contracts have been competitive. And we are trying very hard to create opportunities for small and local business, so that we can stimulate the economy in the impacted areas. One of the most notable areas I mentioned earlier was the debris, about a $2 billion mission assignment from FEMA to do that. We have given all of our debris contracts so far to large businesses, because we face that tension of a rapid response and getting things going quickly, which you can do with large firms that can mobilize and bring resources to bear very quickly, versus the need to stimulate the economy through use of small and local businesses. A small and local would require the more dispersed effort on our part and would have been much more difficult to get the kind of traction we've gotten on the debris effort. So unfortunately, we have given out $2 million of capacity in the -- or $2 billion worth of capacity in debris contracts. I want to underscore the word "capacity." What we do is, we advertise these. We had 22 contractors that bid on these. We found 17 to be acceptable, and we awarded to four. We awarded four $500 million capacity contracts, and we will start then issuing task orders against those. At the same time, though, we'll be looking for opportunities, now that the crisis is largely past, to create opportunities in debris and roofing and other areas for small and local business to get involved. So in summary, we feel like we are at the early stages of setting the conditions for recovery. We think we have a good plan and a way ahead. We feel like we're certainly adequately resourced through FEMA to carry out what we need to do to do our ESF-3 responsibilities. And we're also now standing up and reconstituting our capability to respond to any other natural or terrorist attack -- natural disaster or terrorist attack that might be looming on the horizon. Well, thank you very much for your patience, and I'd be happy to entertain any questions you might have. Yes, ma'am. Q On the levees, could you walk back through that in a little more detail for a second? Q -- which is what you had. Why not -- just for us laymen, why not go ahead and, number one, rebuild to 4: is it a question of finances or risk benefits? And what's your feeling about this possibility of a design error? Do you think there is one? What's -- what's your initial analysis? GEN. STROCK: (To staff.) 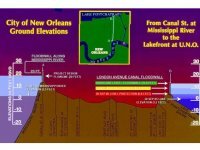 If I could have the slide that shows the levee system? Can you pop that up here for me? First of all, why not go to cat 5. The principal thing is authorities. We must have authority to do that. We must be directed through legislation to put that level of protection in. So that's the first thing that's necessary. We have been studying the feasibility of a category 5 protection for a number of years. In 1999 we were directed to begin that study. 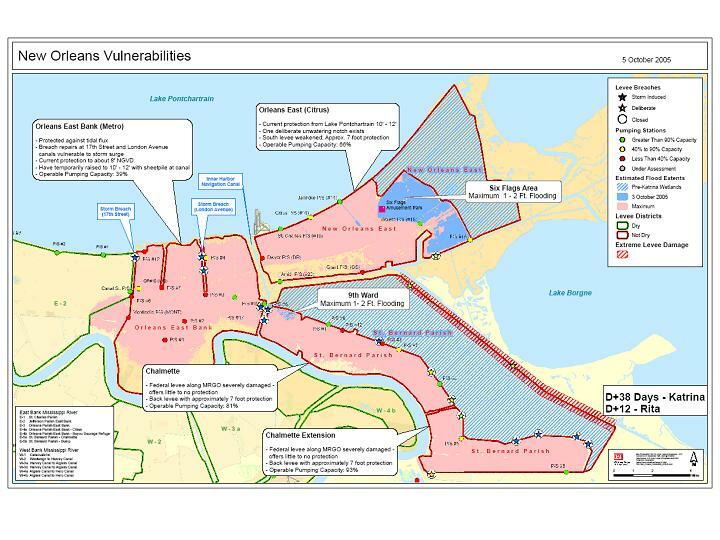 We do a thing called a reconnaissance study, and essentially that's a study to look at whether or not it would be feasible to provide level 5 protection to the city. And a very important aspect of that is whether there's a federal interest in doing so, because the federal government does not get involved unless there's a federal interest. And all of these projects are done with a local sponsor who provides a cost share. The levee system we're talking about here -- and it's mainly -- well, there are a number of projects here. Most of the levees you see depicted here are part of the Lake Ponchetrain hurricane protection system, funded 70 federal, 30 percent local. And once we build the thing, we turn it over to the locals for ownership, operation and maintenance. So part of it is the authority to go to category 5. That reconnaissance study indicated it was feasible, and there is a federal interest. The next step is to go to a feasibility study, where you begin to get into detailed planning. This, again, is cost-shared. Reconnaissance is all federal; feasibility is 50-50 cost share, and the cost of that study is probably about $12 million to get that study complete. So that's the next step, would be to move into that phase with the local sponsor. And I'm sure there will be a lot of interest in moving that ahead as quickly as we can. Q And it's -- the design there? By the way, do you need that also to go just to 4 or only to go to 5? GEN. STROCK: Four or five. Right now our authorization is to category three. Q And what's your instinct on the question of a design error? Is it a design error, or maybe the storm was stronger than anybody thought? GEN. STROCK: Well, that's -- that's what we have to find out, ma'am. What I -- I'm being very careful to describe these as breaches and overtopping where we know overtopping occurred. But in the canal sections, where we had flood walls that were breached, I'm not calling those failures yet, because a failure is when something doesn't operate as designed. And what we have to go down and look at, what forces were put against these structures. We know that the hurricane was a Category 4 when it made landfall in Louisiana, which was away from New Orleans. And then we know that it was a Category 3 when it made landfall in Mississippi. These storms are characterized by wind speeds, by storm surges, and by the barometric pressures associated with them -- all of them have an influence in the pressures and stresses put on our structures. So we're going to go through a very detailed engineering analysis to find out what stresses those projects were subjected to; whether it was a question of overtopping, erosion -- just why it is that those flood walls breached. I really don't have any intuitive response to that, except to say that we know that down in here -- this is St. Bernard's Parish here -- that the levees back here were clearly overtopped, overtopped by a storm surge coming out of Lake Borgne. We saw the same thing further to the south in Plaquemines Parish. Breton Sound, we think the storm surge coming out of there caused the overtopping of those levees. Up here in Lake Ponchatrain, we're not sure whether it was overtopping or whether it was simply the hydraulic impact there. And the thing that we're really looking at here of interest is that you have flood walls all along the lake front here. The flood walls that breached were in these canals in narrow areas. So perhaps there's something associated with the hydraulic activity inside those narrow canals, and that's what we're really focusing our efforts on here at the 17th, here in the London Avenue, and also in the inner harbor of New Orleans. And here we have the Missouri River Gulf Outlet which could have forced waters into here. We have a Gulf Intracoastal Waterway, and then we have a navigation channel coming out of the lake here. So we're going to look at how that water moved in there, what impact that might have had on the structure. Q So sorry, very quickly. When you say hydraulic, do you mean mechanical issues? GEN. STROCK: Hydraulic in terms of moving water. GEN. STROCK: No, ma'am, no, it's just the moving water. Yes, ma'am. GEN. STROCK: Sorry for that lengthy -- it's a very, very complex task to take on here. Q Can you be a little -- can you give us a little bit more detail on the contracts that have been issued to date? Can you just say about how many total there have been issued for what, generally, total amount of money, and then of that, how much were sole-source contracts? GEN. STROCK: Yes. That's a constantly moving thing, and there's all kinds of ways to look at how much -- how many task orders have actually been delivered versus a contract in place. Debris, for example; we have $2 billion of capacity, but we haven't issued a lot of task orders against that, I mean not in a relative sense. Just some figures I have, the latest I have right now is we have awarded, through a competitive -- through contracting, about $500 million of contracting. About -- and this is not -- this does not include those debris contracts, aside from those; $500 million, about half of that has gone to small business. And of those 18 contracts to small business, eight of those were awarded sole-source as a relatively small part of that. On the large business side, 28 contracts to large business. So that's a total of 46 contracts; 28 of those have gone to large business, for about $240 million, and of those, five were sole-source based on emergency situations. Q What are these things for if they're not for debris? GEN. STROCK: Well, they're for services like data gathering, dump trucks, things that can be provided that are not -- not more complicated projects. Also there's a dollar threshold associated with this, and I can't recall what it is. I think it's about $250,000. It was raised to that for this particular event. Q And can you project out how much you think this will cost? GEN. STROCK: The overall response? Well, we have over $3 billion worth of mission assignments from FEMA, which includes the debris, the ice, the water, the power and the roofing. So that part, about $3 billion. 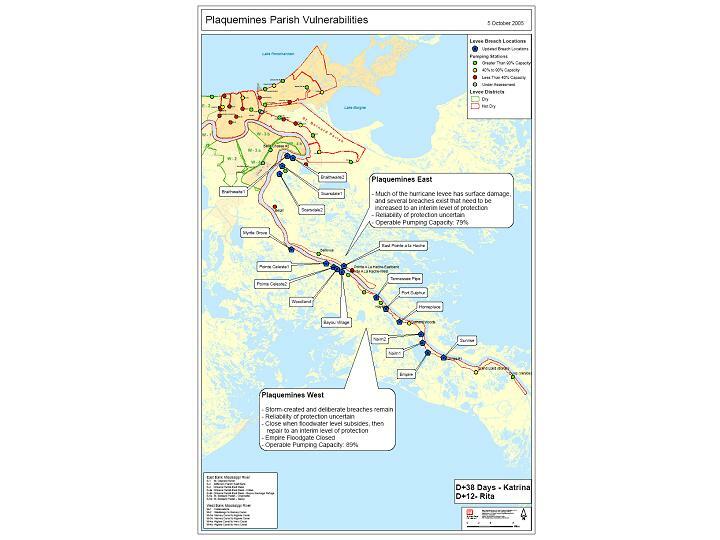 We think that the restoration of the levee system in Plaquemines Parish and in the parishes around New Orleans is probably going to cost about an additional $1.6 billion. And we have already received around $450 million in funding to carry out our work on navigation and flood control. So you're talking about $2 billion there probably associated with the repair and restoration of the levees and navigation systems. So all together, the Corps of Engineers, probably about $5 billion in this effort. 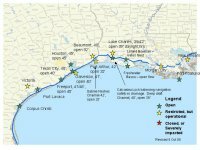 Q You mentioned last time that there was a study that showed, as you remembered, it would cost about $2.5 billion -- a minimum of $2.5 billion to bring these levees up to 4 or 5. Have there been any concrete steps taken toward that? I mean, you mentioned earlier that you-all would need authorization to do that. Have there been any concrete steps? GEN. STROCK: No, not to move ahead to the Category 5 protection, no, sir. That still remains an initial estimate, and it's somewhere between $2.5 and $3.5 billion, depending on what you decide to do. Q And also, to use that terrible Pentagon word, has the city been un-watered? How close is it to being un-watered? GEN. STROCK: Today -- it should be unwatered today, and I believe it is. I think we're pretty well down. There may be some small pockets here and there, but the city is essentially dry now. And we have restored -- I mentioned earlier, prior to Rita, we had a 7 foot level of protection; that's 7 feet above the normal level of Lake Pontchartrain. That's now at 10 feet at all the breached sites in and around the city. So we have gotten that level of protection restored. We use the un-watering term because once water gets into a structure, you have to un-water it. Dewatering is keeping water out of a structure or construction site, so sorry for that little twist of words there. GEN. STROCK: There are various levels depending on where you are in the system. Some of these flood walls are as high as 17 1/2 feet. 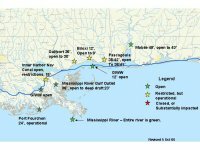 The initial -- the system is designed to handle a surge in Lake Pontchartrain up to 11 1/2 feet, and then we build above that for wave action and the factor of safety. But that would all come prior to next hurricane season. Q I'm sorry. You mentioned you needed legislation to move to Category 4 or 5. Is that congressional, or is that at state level? GEN. STROCK: It would require congressional legislation. I mean, the state could do it on their own, but obviously they'd like some federal assistance here. But that would be congressional legislation. Q And walk me through the process. The next step would be a feasibility study, and then how long does that take? And what happens after that? GEN. STROCK: Yes. Well, in normal times a feasibility study of this complexity and magnitude would probably take us 24 to 30 months just to complete and get to what is called a chiefs report. And the chief’s report says is it technically feasible; is it economically justified; and is it environmentally acceptable. We clearly -- if directed to continue with this Category 5 study, we need to compress that timeline. One of the challenges we have -- there are certain blocks of time which you must into a schedule. These are typically associated with the National Environmental Policy Act. The NEPA processes of public notification and comment, which require you to have a period of time that can be -- that things can be scrutinized by the public and interested parties. Q Are local governments going to have to hold hearings on -- if the Congress says, yes, you can upgrade 4 and 5, are there going to have to be public hearings at the local government level, from people who live nearby where they can object if they feel that live near it, but they don't want it to go up to 4 or 5? GEN. STROCK: Yes, and that's the NEPA process. It allows people to have their say. It allows people to look at it from all aspects, from environmental, social, economic, and it allows them to have their say, which we consider in making our recommendation. Q Do you know how long that process takes? GEN. STROCK: Well, that's why I say a feasibility study to get to a chief's report and get through all those processes is 24 to 30 months, normally. Again, we'll try to compress that. And then the actual construction is the other limiting factor, the physical business of constructing the project. Depending on what we decide to do, it could be years before we get it. Again, if we are given the go-ahead to implement, then we will look for ways to fast- track that construction and get it in place as quickly as possible. Q You were talking about the problem with the pump, the fact that a large number of them are incapacitated. Are they broken, or are they -- you can't get to them because of debris? What is the problem? And how long do you think it'll take to fix it? And is that your mission? GEN. STROCK: The main problem is damage during flooding. (To staff.) 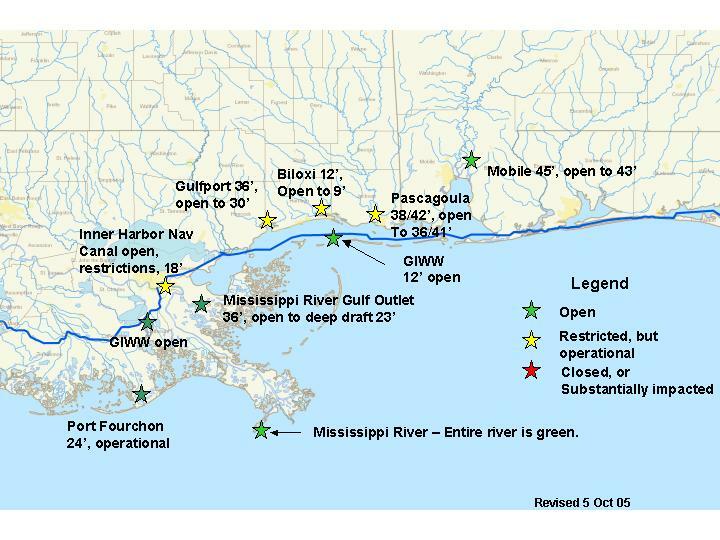 If you could go back to this one -- yeah, I'll show you this one -- and then maybe the cross-section, and many of your -- what you see -- and I know you can't see it very well here, but these dots down here are pumping stations. The newer ones are up along the levees here. Some of the older ones -- some of these have been in place for a hundred years or more. These are -- some of these are old, old systems. These pumps are part of a thing called the Southeast Louisiana Project, and they are all about de-watering the city, keeping rain -- getting rainwater out of the city. These are not meant to fight floods. So this is just about interior drainage. And so there there's a certain limit to their capacity. And the way they're positioned in the city, if the city is flooded, when the city was flooded, the pumps and their electrical infrastructure went under water because they're not designed to operate during floods. So our challenge now is getting the water out of the city, bringing the pumps out of the water and then getting them rehabbed and back in shape. It requires us to drain the fluids out of the pumps and replace those. It requires us to rehab generation and get power back in and so on. So that's the challenge right now with the pumps in the city. Q How long do you think it will take? GEN. STROCK: Well, I can't give you a good answer on that. We went from zero to about 40 percent here in the central part of the city in about three weeks. Some of these are long term, as I mentioned; some of these are very old pumps, and in fact the only place you can get parts for these pumps is manufacturing sites down in this area of New Orleans where they actually build parts for some of these pumping systems. So I can't give you a good answer on how long that might take. Q But if next week, say, there were sustained heavy rains, you could end up with another six feet of water? GEN. STROCK: Yeah, at the outside. We've got our hydrographic models that show us for various levels of rainfall in the city how much ponding we could expect based on the condition of the pumps. And if you look up at this area of the city here, this is the lowest part of the city, this is where you might get as much as six feet if that should occur. And then as you move toward the Mississippi River, the flooding is less and less. Could I have that cross-section, Mark, if that's available real quickly? (Pause.) This is what we face here. If you look at distance from the sea, this is the Mississippi River over here, and this is the side of the city the French Quarter's on. In fact, the French Quarter's right there. 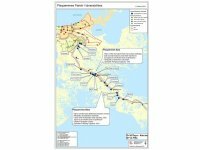 This is cut through the city from the French Quarter to the University of New Orleans. This point right here is 116 miles from the ocean by river. This point here is essentially at sea level. Typically Lake Ponchartrain is about one foot above sea level. And this is the real challenge of New Orleans here. The ground was built up by the Mississippi River, and so you have the higher portions of the city here, which are not as prone to flooding, and the lower portions over here. And we have a series of bowls within the city that will fill up with water. This is where the pumps are supposed to move that water out of here. And that's the challenge we face in New Orleans for rainwater. Did I get all your questions in? Thank you. Q General, with the time frames that you mentioned for studying and constructing, would that be further compressed if you went to a different system? 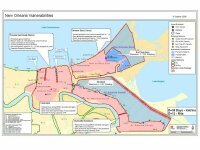 You mentioned last time you were here about some sea walls that were rejected last time. Would that be a possibly quicker way to do this? If I could have the navigation chart here, I'll show you what we're talking about there. (Pause.) This was a -- and there's a lot of controversy associated with this. One more. There we go. The original 1965 proposal by the Corps of Engineers was to build barriers down here -- this is Lake Ponchartrain, and you have narrow inlets down here, and the idea was to build barriers there which could be closed in times like this to prevent a storm surge getting up into the lake. If you built those barriers and took off a good part of that storm surge, you could protect New Orleans with lower levees. 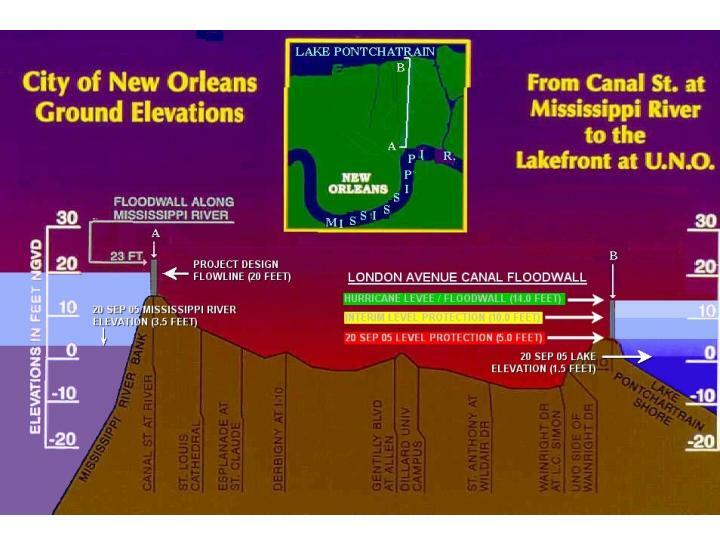 At that time the levees -- we thought 10- to 14-foot levees would protect New Orleans if we installed those barriers. We now have levees on the magnitude of 16 to 17 feet around New Orleans. 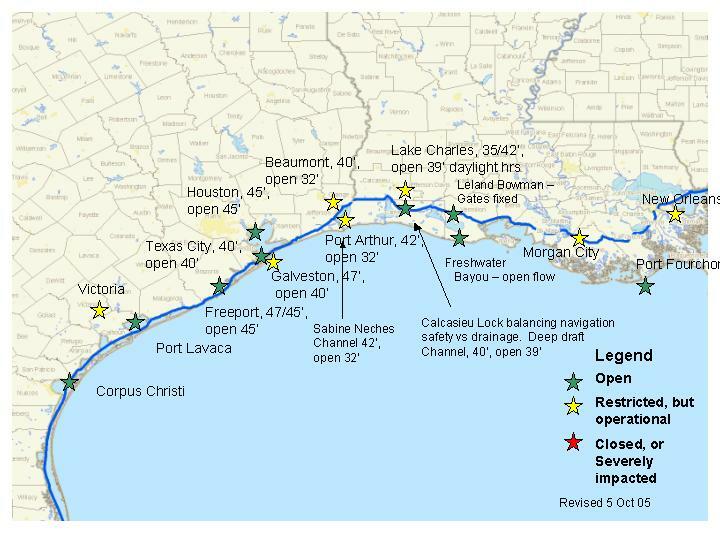 So lower levees because you had a barrier to take off the storm surge. For a lot of reasons, we abandoned that plan and went to what we've called a high level plan of protection, which is what we currently have. So, that would certainly be something we would consider as we look at that category 5 protection. Q What are the objections to the barriers? GEN. STROCK: Well, you know, it's a real complex and long story. Recall that in 1965 this was our proposal; in 1969 the NEPA act was passed, and that required environmental impact statements and studies. The original project was challenged on the adequacy of the environmental impact statement and concerns over restricted water flows into Lake Ponchetrain and the effect on that ecosystem. And then there was a significant amount of litigation that lasted about 12 years, when we finally said we will not do the barrier plan, we will go to the high level plan. And there were a lot of steps in between that, some of which drove the costs in a different way. The barrier plan in 1965 was felt to be the most economic plan. But by the time we got into the '70s, the high level plan actually became more cost- effective than the barrier plan. So, depending on where you want to take a snapshot in time on this project, you could make a case for either approach. The barriers are an effective mechanism. The city of London in England is protected from storm surge by a moving surge barrier. Holland has a series of extensive barriers that are put in place when the North Sea swells occur. So it's proven technology, and it's something we would consider as a solution to cat 5 protection. GEN. STROCK: Well, we have authorization, sir, now to -- there's an authorized study. And that study has gone on. What it would require is funding to move to the feasibility stage. In this year's water resources bill there is funding in there -- not enough -- about $250,000 from the Senate to begin the study. So there's an opportunity as they conference that bill between the House and the Senate to put the adequate resources to accomplish this study. We think if we cost share it would take about $4 million to take care of next year's study. If it -- if we do not get a local share, then about $8 million is what it would take to do the study. MR. WHITMAN: All right. Thank you very much. GEN. STROCK: Well, thank you all very much.